The Chinese Crested is a polite, gentle, loyal, happy, lively, and loving companion. He loves snuggles, cuddles, and to get hugs, and is extremely devoted to his owner. He will follow you everywhere, even to the bathtub! He is very people-oriented and needs to be with his family. He's a well-mannered, sensible and steady dog who is sweet and fairly sociable, but can be suspicious of strangers. Since he's generally quiet and not a barker, he's not a good watchdog, although he is alert and may let you know if he sees someone new. He's not easy to train or to housebreak. He is a sensitive dog who needs gentle training and patience. He's generally good with other pets and dogs, and is exceptionally good and affectionate with children, as long as they remember his bare skin means they need to be careful with him. He loves to play on the carpet and do tricks, and howls when he is having fun. He also loves to climb and to dig! Indoor exercise is good for him, and also occasional walks and supervised romps outside. He will need a sweater in the winter to keep warm, and a t-shirt in the summer to avoid sunburn. He virtually doesn't shed, and so would be a good pet if you don't like dog hair in the home. 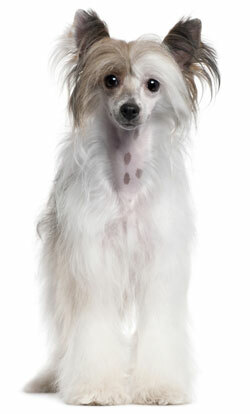 The Chinese Crested is 11 to 13 inches tall (to shoulders) and weighs 5 to 12 pounds. He has medium-length soft and silky double coat. His coat can be any color. He needs an occasional brushing. The Chinese Crested is believed to have descended from African dogs called "African Hairless Terriers." Chinese explorers discovered this breed, brought it back to China and bred it for smaller size. By the 16th century explorers could find this dog not only in Asia and Africa, but in Central and South America as well. The Chinese Crested became popular in Europe in the 19th century and in America by the early 20th. The famous entertainer Gypsy Rose Lee kept a Chinese Crested for a pet in the 1950's, and helped to make the breed even more well-known. His AKC popularity was 52nd out of 157 breeds in 2007.